Kitchen – Paperwork – No Match! A very common request for organizing is the kitchen and more specifically the kitchen with paperwork. The two aren’t necessarily a good marriage. Yes, some kitchens are equipped with the means to properly store paperwork by having a desk area (built in or not) for the storage of your key papers. But many kitchens are not and the counters become a cluttered mess. It becomes the filing system and not an organized one at that. It’s best to store your paperwork in another area of the home … unless you have a desk area specifically for this household need in the kitchen. Really the only paperwork that should be placed on the counter is your daily mail for that day and a “Tickler File” if you find that system effective. I am a strong proponent of keeping paperwork out of your kitchen. If you are not fortunate enough to have other options, then be sure you containerize your papers in the kitchen. Let this container be upright and not horizontal. One of the biggest problems is the mail because it is something we receive continually. We get mail daily and if we are not on top of it by tending to it as it comes in, our kitchens will be on overload. It truly takes only a few minutes to go through the mail as it comes in. Dealing with it each day will prevent those piles. You then feel overwhelmed because you don’t have a large segment of time to deal with it. Dealing with it as it comes in is more efficient and time saving. Immediately toss junk mail. Don’t even open it. they can be placed in their proper place. for each piece of mail at that moment. Here are some tips to help you get a handle on that mail and paperwork … if it’s kept in the kitchen. Create a central area that all mail will be handled. Here is one option you can choose for how you will organize your mail. A simple idea could be to have 3 bins or baskets. One for “magazines/newspapers,” one for “bills,” and one for “things to do.” I prefer vertical files so if you are going to use a bin or basket, do not let it overflow with paper or magazines. If you are a subscriber to a lot of magazines, first consider unsubscribing to the ones you don’t even look through. Then have a magazine rack close by. When a new magazine comes in, the old one gets recycled. DO NOT, I repeat, DO NOT open junk mail. Just recycle. As a matter of fact, depending on how you get your mail, drop it off in your recycling bin even before it enters the house. Have a bin for each family member. As the mail comes in, put their mail in their designated bin. Instruct them that they must tend to it daily or at least a couple times a week. 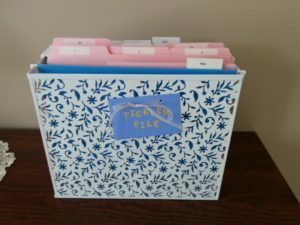 Have a “To File” folder to place those items in that need to be filed in their permanent place but you don’t have time to do every day. Do not let the folder overflow with papers. Before it gets unmanageable, designate some time to file each piece in their proper folder. Do not create another “To File” folder if it get full. Have only one and tend to it before it overflows. If on a particular day you cannot tend to the mail according to the system you created, then have a nice decorative bowl or basket and place the mail in there next to your Organizational System. Do not start a pile on the counter. Be sure to tend to the mail the next day when the new day of mail comes in. Don’t create a pile of mail in the bowl or basket either. That was only a temporary stop. Set up a “bill-paying center” in your home. It would be best to not have it in your kitchen. But if it must, then be sure you have everything you need in one location to pay bills (checkbook, postage stamps, return address labels, envelopes, a pen and a calculator). Set up a Tickler File System. It is an upright vertical file that helps you quickly sort your paperwork/mail. Contact me for specifics on how to set up this system. Do you currently have piles of paperwork on your counters? Take each pile and flip it over. Let the bottom be the top. You will probably be able to quickly go through this pile because what is on the top now is old and out dated and probably can just be tossed, shredded or recycled. If you want to protect yourself from identify theft, consider tearing off mailing labels from magazines or junk mail. Shred any piece of mail that has private information on it. So here you have it! These are some quick thoughts about the function of your kitchen in relationship to paperwork. As I said, paperwork, if at all possible should not be kept in the kitchen. 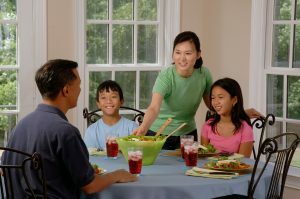 The kitchen is for eating and having family time around the kitchen table. Seeing piles of papers on the counter prevents you from perhaps enjoying baking with your children, or teaching them how to cook or doing a fun art project. If you have to clear off counters before you can start, you probably won’t even begin. It will feel too overwhelming. If you feel your kitchen is too much to bear and you don’t really know how to get started, consider hiring a Professional Organizer. We have the expertise to help you sort through this task with ease and efficiency.